New: iPad Landscape Support ! Enhanced: Hyphenate in Spell Out. * Available in Full Screen Mode. Thanks for e-mailing those love & feedback. This is not the major update that we told you. Major Update Coming Soon. New: You can copy | paste numbers on calculation. New: Regional support for Countries* using decimal comma. Thanks for e-mailing those love & feedback. *Countries: Albania, Andorra, Argentina, Armenia, Austria, Azerbaijan, Belarus, Belgium, Bolivia, Bosnia and Herzegovina, Brazil, Bulgaria, Cameroon, Canada (French-speaking), Chile, Colombia, Costa Rica, Croatia, Cuba, Cyprus, Czech Republic, Denmark, Ecuador, Estonia, Faroes, Finland, France, Germany, Georgia, Greece, Greenland, Honduras, Hungary, Iceland, Indonesia, Italy, Kazakhstan, Kirgistan, Korea (both North and South), Latvia, Lebanon, Lithuania, Luxembourg, Macau (in Portuguese text), Macedonia, Moldova, Mongolia, Morocco, Netherlands, Norway, Paraguay, Poland, Portugal, Romania, Russia, Serbia, Slovakia, Slovenia, South Africa, Spain, Switzerland, Sweden, Tunisia, Turkey, Ukraine, Uruguay, Uzbekistan, Venezuela, Vietnam. New: When you share calculations through email, people can import them directly in to Calzy. New: Now "start with last calculation" is user controlled, you can toggle it off in the settings. Enhanced: Double Tap Recognition on iPad. • Redesigned for iOS 7. • Completly new expression editor, which lets you edit, reorder and delete values. • Ability to bookmark a calculation with a note. 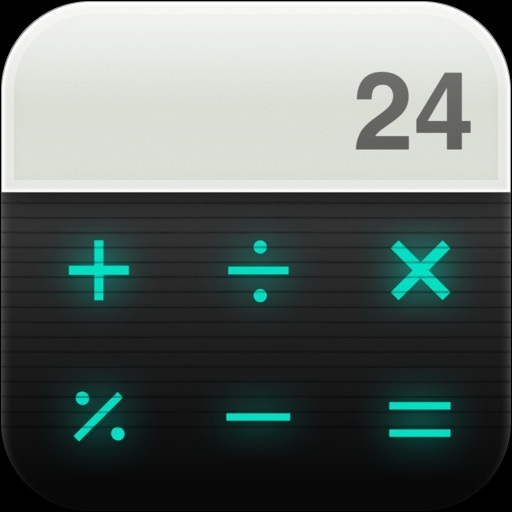 • Ability to share your calculation through AirDrop. • Ability to copy spell out. • Dark/Light mode ( Multiple Color Themes ). • 'Original' Theme style has been improved to match the older version. • Bigger Tap Radius in iPad. • Auto Theme, Ability to change between light and dark theme automatically based on your screen brightness. • Spell out in more than 200 languages. • Customise Calculator Typeface (Thick/Thin). • Ability to Paste Expression. • Japanese, German, Chinese, French Localizations. Added: Japanese, German, Chinese, French Localizations. The developer advises that there has been an update to version 2.5.5 of the App. The developer advises that there has been an update to version 2.5.6 of the App. This update features lots of adjustments behind the scenes to make it easier for us on the iOS 8 update. And also Calzy is now more responsive. • iPhone 6 and iPhone 6 Plus resolutions.